Chris of Frecklemama is the mama of The Stash Bash. She puts it together each year, and puts in loads of work to make it the amazing, inspiring, awesome event that it is. I'm also lucky to call her my friend. She's so hilarious - if you don't follow her on Instagram @frecklemama then you are absolutely missing out on her crazy pets, fantastic one liners, and her epic morning hair. I wanted to say thank you to her in a way she could see every day, so I decided to make her something she could put in her sewing room. 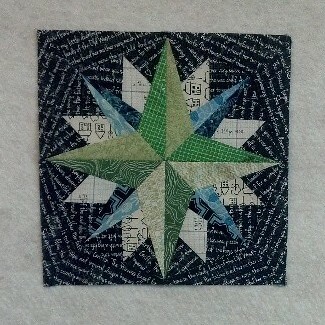 I chose to make the fantastic embroidery pattern on the cover of the Studio Stitches pattern from Empty Bobbin. 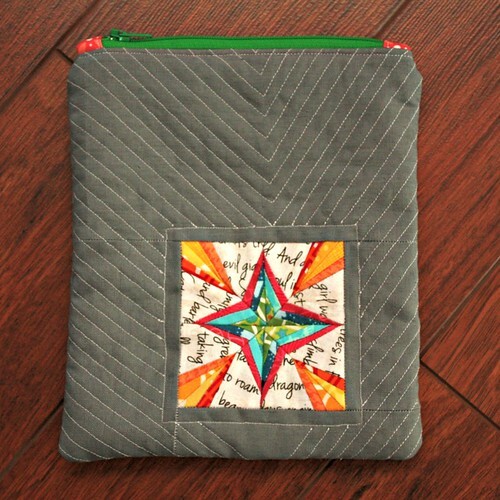 It was the perfect way for me to try out some stitching with Aurifloss. I'm not a super experienced embroider-er, but I've found it to be a lot of fun. And the Aurifloss was a dream to work with. Why on Earth doesn't every single kind of embroidery floss come on a wooden spool?? Oh my, that made embroidering even more enjoyable. 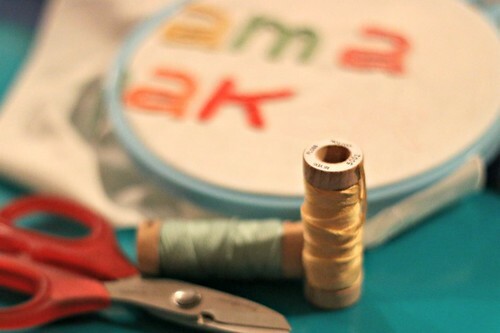 No thread snarls with this adorable little spool, and did I mention how cute the spools are?? Chris's favorite colors are these kinds of soft pastels, so I had the perfect palette to work from, the Vintage Linens Aurifloss collection. I used some painter's tape and card stock to mount it in this vintage-y frame I found at Michael's. It may be the worst mounting job in the history of embroidery, but it works and it fit into the frame, so I think it looks pretty good. I was really excited to give it to Chris when I arrived. Don't you love giving a gift that's just beyond appreciated? That's what it was like to give this to Chris. Doesn't she look tickled? 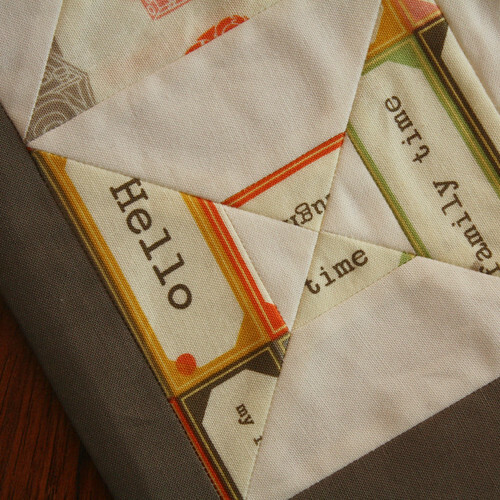 The other handmade gift I made went to Jacey of Jaceycraft. Jacey and I have met a couple of times in the past, but for The Stash Bash I was her Sew Secret Agent, the secret person giving her some fun secret gifts throughout the weekend, including this pouch. I used another one of the embroidery patterns in the Studio Stitches bundle to make the embroidered part of this little pouch. I just love this little Featherweight style machine! I again used my Aurifloss stash, mostly using colors from the Color Threads bundle. I also gave Jacey some other fun little items to sweeten the pot, like a fun cat t-shirt and a pack of my favorite colored pencils. I had a terrible time trying to keep my poker face as Jacey opened her goodies! But it was awesome to get to tell her that I was her secret agent, and Amy of Needled Fig helped capture that awesome moment for us. 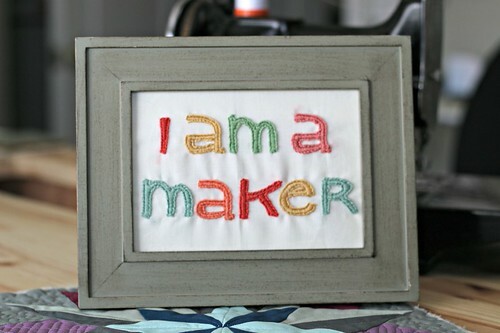 Just thinking about all this makes me want to pick up a new embroidery project right now! Hmm, I better check my stock of Aurifloss, because I think I might be hooked! Loads of progress, not to mention fun! Firstly, I have to tell you I sat with some seriously cool and fun people at The Stash Bash, who worked on some awesome projects. I sat with the Birmingham MQG gang of Katie, Marla, and Kim. 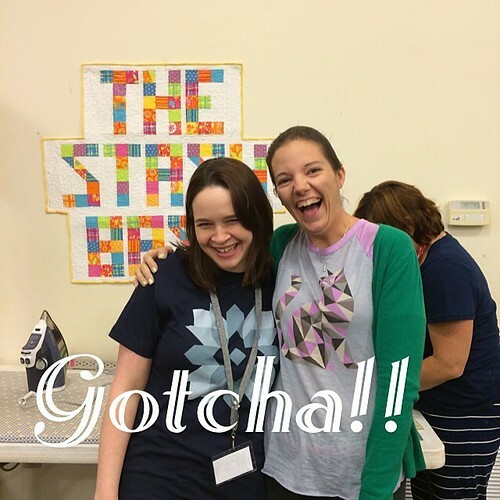 Katie whipped up the beautiful quilt on the left here using Les Amis (and basted and quilted it!) and Marla stitched up the one on the right, from Elizabeth Hartman's Modern Patchwork book. These girls literally kept me in stitches throughout the weekend. So glad I got to meet them and hang out with them! I also got some beautiful goodies from Katie, including this beautiful pouch, stuffed with a fun charm pack of Happy Go Lucky by Bonnie & Camille, in the pouch swap on Saturday. Katie also gave me a twin to this pouch along with a fabric covered clipboard. Seriously, how did she know that I love clipboards?!?! So sweet! As for me, I packed a bunch of projects with me to work on at The Stash Bash, not sure of what I'd be in the mood to work on. 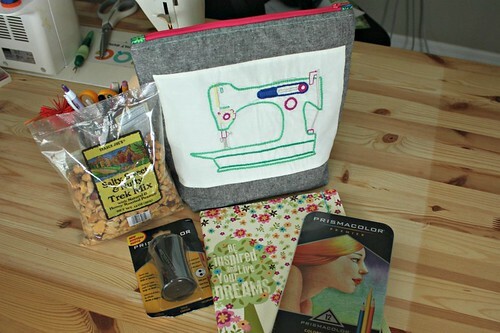 Once I arrived at the sunny, yet cool and quiet location in Hampton, GA, I unpacked my car and set up my sewing machine. I started right in on my Aeroplane bag first, and knocked it right out before we even had dinner that first day! After the bag, I wanted to work on a new quilt, using some of the Urban Chiks' Dream On yardage and charm packs I've been hoarding for a long time. I used Jeni's great patchwork chevron tutorial from the Moda Bake Shop, but I upsized the quilt a bit to make it large enough to cover my bed. I haven't gotten a good picture of the whole thing yet because it's so big, but once I quilt it, I'll make sure to get some better pictures. 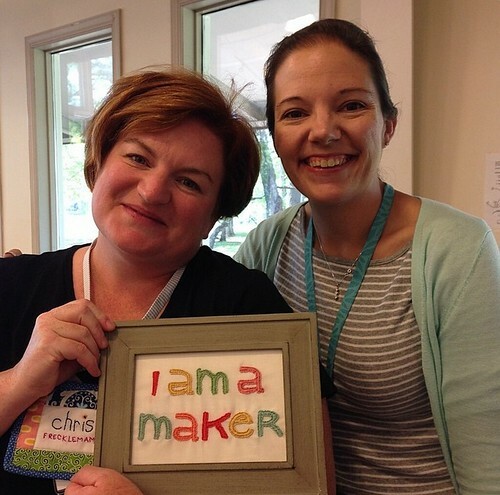 By Day 2 of the retreat, I shifted gears and worked for a bit on an improv project using Denyse Schmidt's Hope Valley. I didn't get very far on this one before my quilty ADD kicked in and the desire to work on something else drove me to another project. 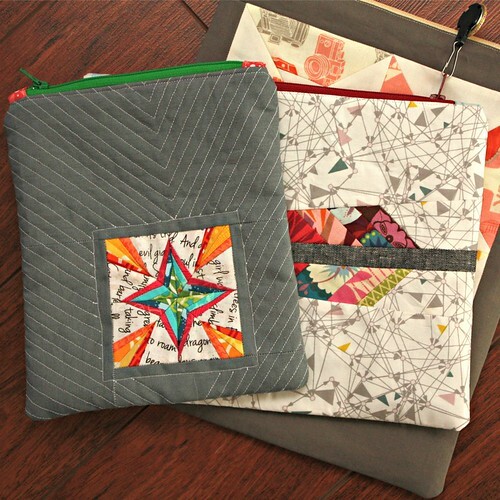 My husband has requested I make him a mariner's compass quilt, using the same Madrona Road Memoir print I used in my A Light in the Dark mariner's compass mini, so I packed up some fabrics and templates to get started on that for him at The Stash Bash. I managed to get through one block, Which Way North. I haven't spent a ton of time plotting this quilt out, so I'm not sure exactly how many blocks I'll do just yet, but I would guess at least 16 or so, so you'll be seeing lots more blocks like this one in the coming weeks. Last but not least, I worked on a little bee block, using some beautiful Ruby by Bonnie & Camille. 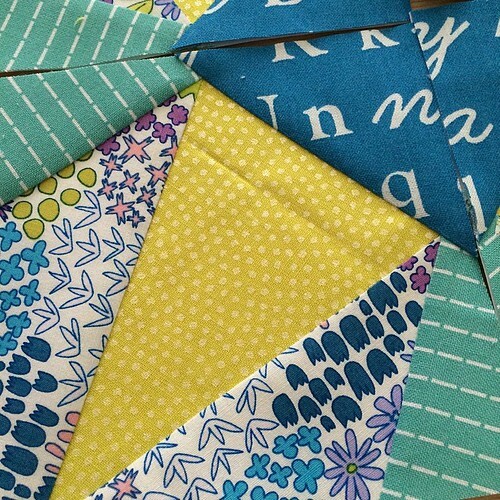 I made a simple zig zag block, and I can't wait to see how the whole quilt comes together soon. I got a sneak peek at the other blocks, and I can tell it's going to be a stunner! I hope you've had a great week, and I hope you have a wonderful Friday! Did I just put that Red Hot Chili Peppers song in your head? You're welcome ;) It was in my head the entire time I worked on a bag I've been looking forward to making, the Aeroplane bag, pattern by Sara/Sew Sweetness. My Aeroplane bag was the first project I attempted to tackle at The Stash Bash over the weekend. I had spent a few hours piecing together a patchwork panel for the front and back of the bag, and quilting-it-as-I-went, and prepped all of my interfacing and other pieces before I headed up to Georgia. I was really surprised at how fast it came together once I got my sewing area all set up in the sewing room. I think it probably took no more than three or four hours to put the whole thing together, which is probably how much time I spent making the patchwork panels, so this is definitely the kind of bag you could tackle making in a weekend. I made the Long size of the Aeroplane bag, and it is truly humongous. The Regular size is just as tall, just slightly less long. I can easily fit everything I need for a weekend trip in this bag, no problem, with room to spare. I also really like how long the handles are, it's quite easy to carry around. The directions for the pattern were supremely clear and easy to follow. The bag is literally assembled much like a zippered pouch, so it was fairly simple to put together. This was my first time working with Annie's Soft and Stable, which was really easy to use and did give the bag a lot of additional body. I will definitely choose to use it again for another bag in the future. 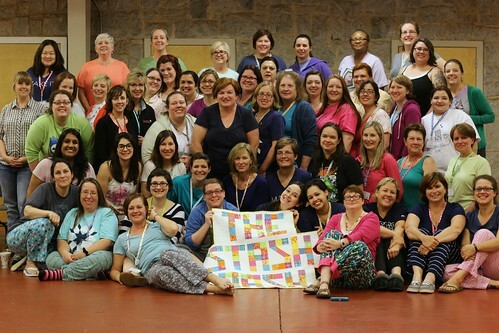 In just two short weeks, my road trip to the Stash Bash retreat will begin, and I'm definitely not heading there empty-handed. We're planning to do a little pouch swap, and there's a few people that I want to bring a special something to as well, so I decided to dig into my zipper stash and make a pile of pouches. I just finished my last pouch yesterday, so that's one more thing I can check off my to do list, yay! The first pouch I worked on is for the pouch swap. 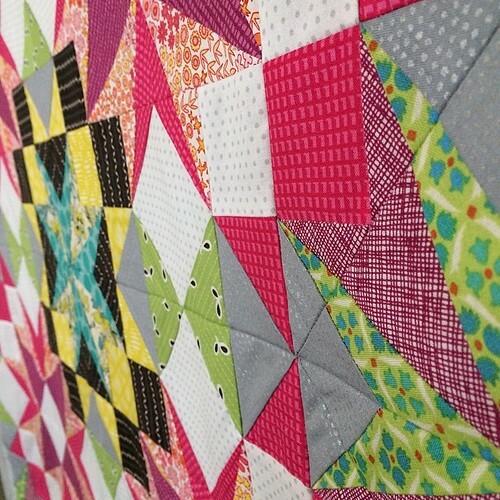 I wanted to do some teeny tiny piecing, and I wanted to use one of my Lucky Stars blocks, so I decided to use the new April block, which will be arriving to club members' inboxes first thing Monday morning. This teeny tiny version of the block finished at 3 1/2" - throughout the piecing, I felt like I needed smaller hands to work with these tiny pieces of fabric! I sashed the block with some Essex linen in Steel, and decided to add a pinstripe effect with some simple quilting on the pouch. 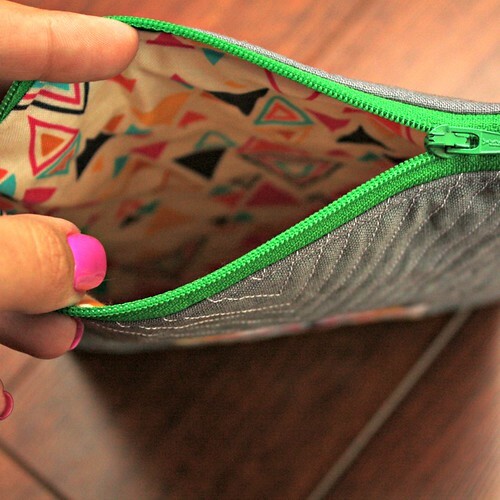 I wanted a bright, fun color for the zipper, so I picked out a fun green zipper, Washi triangles for the lining. On this pouch, I wanted a softer look, so I used Pellon fusible fleece. It's still definitely durable, but would be good for holding a Kindle or a camera, since it's a bit more padded. For the second pouch, I wanted to try to use some of my Anna Maria Horner scraps. I've destashed a lot of my Anna Maria Horner fabric, and used a lot of it, too, so all that's left is scraps. I decided to use an Anna Maria Horner to go with my bits and strings of fabric, her feather pattern, but there was no way that I had enough to make the full-size feather, so I shrunk it. I used the copier function of my printer to shrink the pattern by 50%, and I was able to put together enough strings to make a darling little feather. I used Essex Yarn Dyed Linen in Black for the stem of the feather, and paired it with a mostly low-volume print from Art Gallery's new Urban Mod collection called Triangularity. Isn't that a fun word??? I added a bit more of the Triangularity print around the feather to create a nice rectangular size, and turned it into a pouch. 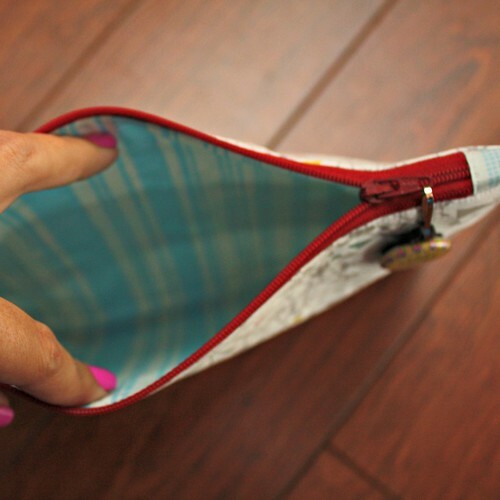 I found a red zipper in my stash that had a cute pull already attached to it, and installed that for the pouch. The lining of this one is from my biggest AMH leftover scrap, a print from her Innocent Crush line, and I used Pellon Craft Fuse for the interfacing on this one - I've used Craft Fuse on several pouches, and I like the crisp look it gives. Stay tuned on Monday for my first update on my duffle progress, and have a great weekend! I'm super excited to be heading to The Stash Bash next month in Georgia, and there's nothing like travelling handmade, having something totally unique and totally you to carry your stuff in. So, I've got big plans over these next few weeks, not only to make a Studio Cherie Quilted Travel Duffle, but I'm also hoping to eek out enough time to put together my Sew Sweetness Aeroplane Bag. six-hour road trip: here I come! The Duffle comes first, because I'm lacking a duffle, and because I'm fully expecting that I'm going to need a duffle, stuffed full of fabric to use throughout the retreat weekend! 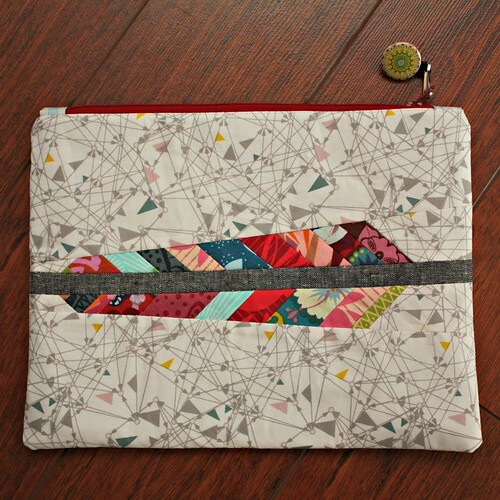 I'm using a super fun Kokka print by Nancy Wolff, but I had a hard time figuring out what to pair it with. Tentatively, I'm planning to use an orange Sketch print for the bag's accent straps, but I'm not sure if it works. What do you think? Is the orange too bold? For my Aeroplane bag, I'm totally going with a QAYG exterior, with either some fun patchwork or some of my Melody Miller stash, like these viewfinders. If I don't get to work on it before the retreat, it's definitely coming with me as a project to work on at the retreat!